Technical Outlook: Near term (daily chart) bearish, longer term (weekly chart) neutral. See conclusions for likely range and bullish/bearish breakout points this week. Conclusions: More volatility, but in which direction? The fundamentals to watch for the near and long term, along with likely support and resistance levels. Last week’s EURUSD forecast was neutral from both a technical and fundamental perspective. This outlook proved correct, as the pair was little changed on the week. Some of our readers complained that the forecast was inconclusive. We replied that we “call it as we see it,” and indeed the technical and fundamental picture itself was inconclusive. Our goal is to save readers the time needed to review the technical and fundamental evidence and make conclusions based on that evidence. We have no crystal ball. If the evidence is murky, that’s what we report. First we look at overall risk appetite as portrayed by our sample of global indexes, because the EURUSD has been tracking these fairly well recently. Compare the S&P 500 weekly chart and the EURUSD weekly charts below, and you’ll see that the pair continued this pattern last week. Our sample of weekly charts for leading global stock indexes continues to indicate suggests a mixed technical picture, as detailed below. Overall risk trends for the US and Europe aren’t showing a clear, unified picture of risk appetite trends, nor does Asia shed additional light on overall risk appetite. 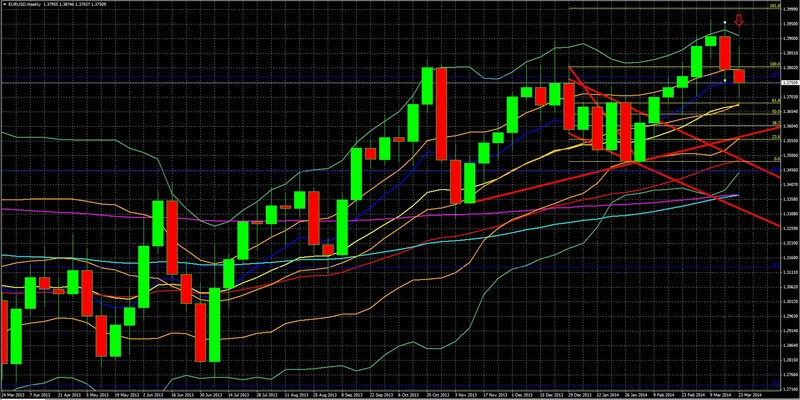 Note however, that the EURUSD weekly chart continues to track the S&P 500. That’s bullish because this index retains its upward momentum, though like the EURUSD itself, this index was little changed on the week. Europe: Indexes remain in their double Bollinger® band neutral zone, suggesting neutral momentum and more range bound trading. Asia: Is more of a mixed bag and so harder to make any meaningful generalizations about stocks and risk appetite. The bullish undertone here is that the move lower was small, and the S&P 500’s upward momentum remains intact. It moved into the double Bollinger® band sell zone, suggesting more downside likely ahead in the coming days. Thursday’s break below strong support of the 50 day EMA around 7.37610, which was confirmed by Friday’s close below that level, opens the way for deeper tests of the following support levels. Resistance around 1.39 is likely to hold and limit any gains. Whether or not economic sanctions against Russia do sustained damage to EU business interests there, especially those of Germany. The bearish argument is that there are real risks of such damage. The bullish perspective is that because the stakes for Germany are huge, that fact alone ensures that Germany’s business and political elite will do all they can to prevent material sanctions that could interfere with business as usual. See here, here, and here for details. The consequences of the EU failed banking union pact: As argued in our special report here, the current deal won’t assure anyone that EU banks have a reliable EU safety net. Even this flawed deal won’t take effect in time to provide any help for banks failing the ECB’s coming bank stress tests. So the ECB must choose between risking a new banking crisis and lowering the standards for its stress tests. If ECB past behavior is any guide, the ECB will opt for the easy way out and lower the standards, as it already appears inclined to do. See here for details. Oh yes, and remember that German banks are especially vulnerable to a sanctions escalation. Serious Sanctions Too Painful For EU, Germany: Meaningful economic sanctions against Russia would cause too much economic pain for Russia and in the EU, especially for Germany, and thus such sanctions are unlikely. Again, see here, here, and here for details. The EUR’s downtrend is believed to reflect a consensus view that the ECB will sound dovish. 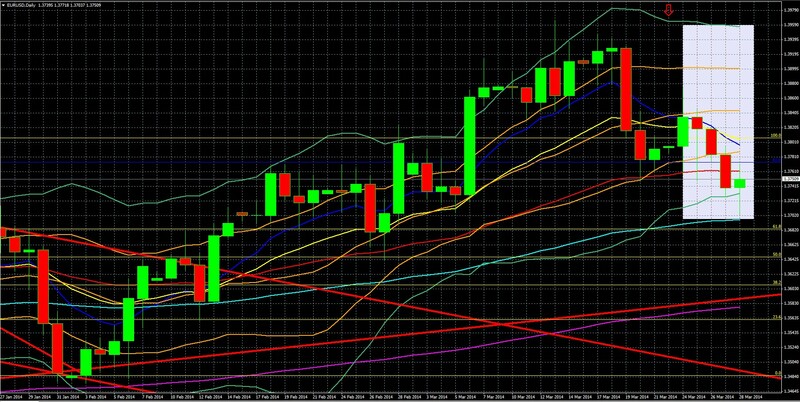 This view leaves the EUR primed for a bounce as we don’t expect any further easing at this time. Markets have tended to overestimate ECB dovishness in the past months, and the EUR has tended to jump after recent ECB meetings. Risk of Painful Economic Sanctions Remains: It’s unlikely that The Cold War v.2.0 is over, if not from Ukraine than from other Russian moves on similarly weak neighbors that are not vital strategic interests of the West and that have large Russian populations. Russian Ruble’s Fall Vs EUR May Make Germany More Open To EUR – Dilutive Easing: Compared to a year ago, the EUR is up 25% vs. the RUB. If the crisis escalates it could fall further, hurting EU business revenues in Russia from some combination of falling volume (if EU firms don’t cut prices) and profit margins (if they do). Although last week saw rising deflation risks in Spain, that isn’t enough to remove German opposition to further easing. US bond yields look like they’re starting to rise vs. those of Germany. If that trend continues, the pair IS heading lower. 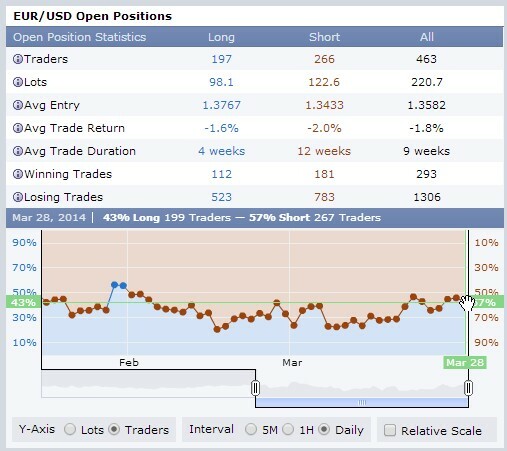 Our real time sample of retail trader positioning remains unchanged from last week. Although the group remains short overall, they’ve shifted to more long positions in recent weeks, as the actual daily technical (noted above) have deteriorated. On a weekly basis, this groups’ moves tend to be wrong. In other words, if they go long, the pair has tended to fall. Japan to Raise the Sales Tax for First Time in 17 Years: The last time this happened it sent Japan into recession. The event itself is no surprise, and effects won’t be immediately clear. The big question how much it hurts Japan and, what kinds of new stimulus will be enacted if the damage is significant. The BoJ has done little recently, and has likely been saving some bullets in case they’re needed now. 4 out of the last 5 months, the euro appreciated on the day of the European Central Bank’s rate decision. This mean Mario Draghi has been consistently less pessimistic than investors anticipated and while this could remain true this month, the odds are against it. a) –Recent weakening in German economic reports. The Ukrainian crisis and fall of the Russian Ruble has already hurt German business performance in Russia and will only help to exacerbate this trend unless the crisis de-escalates soon. b) –The numbers of EU economic policy officials talking about assorted forms of stimulus still available to the ECB suggests they’re getting more concerned about low growth and deflation threats. Ultimately the big question is whether the ECB will see the weakness as temporary or more enduring. We don’t believe they’re ready for new easing yet. However if German business interests somehow fail to prevent real sanctions and limits on business with Russia (unlikely- see here and here – but possible), then German opposition to further easing could melt away. Jobs Reports For US, Germany, Plus Related Precursor Reports (ISM manufacturing, services PMI reports, ADP, etc. : US jobs reports Friday, and the reports that hint at their result (like job components of the PMI reports, ADP non-farms payrolls). Chinese PMIs: These provide the latest update on China’s ongoing slowdown and its severity. These also impact commodity prices and thus the related commodity currencies, as well as overall risk appetite, so they have a double impact on the USD. Many expect new Chinese stimulus to come if deterioration continues. The problem is that the thrust of China reforms is to reduce credit and liquidity. Early Earnings Season Speculation: April 8th marks the official start of US Q1 2014 earnings season with Alcoa (AA), so the tone of early forecasts may be influential. Items 2, 3, and 5 directly impact one or both currencies, so any surprises will be particularly potent market movers. Technical Outlook: Bearish on daily chart, neutral on weekly chart. The pair stays within the 1.39 – 1.37 range. Confirmed breaks above or below these points signal the next move up or down. Fundamental Outlook: Much higher chances of volatility than last week, but any meaningful change in direction depends on if the results surprise enough to the upside or downside. The calendar packs enough top tier events to give the pair its best chance in weeks to make a decisive move after last week’s drifting. That said, if rate differentials continue to expand in favor of the USD, then it’s just a matter of time before the near term EURUSD downtrend becomes more entrenched. Longer term, high asset valuations, US tightening, geopolitics suggest EURUSD moving lower. That said, we don’t open short positions until we see more confirmation. We’re getting closer, but we’re not there yet.